On Saturday 11th August, Kristan Harvey on fiddle and Tina Rees on keyboards were the featured performers. Their concert was staged under the LIVE MUSIC SHOW banner. Free shows can be varied in quality. This was a real gem. The two young ladies are highly accomplished and confident performers. 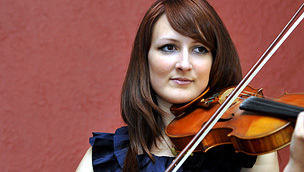 Kristan Harvey is a winner of the BBC Young Traditional Musician of the Year. She hails originally from the Orkney Islands and a selection of jigs, reels, strathspeys and airs from this part of Scotland formed the basis of their set. They gave the music their own interpretation. Usually, it is the fiddler who has the lead with the keyboard player having the lesser accompanying role. In some of the tunes the melody lines were shared out. Thus Tina Rees had an equal share of the limelight. There was a pleasing variety of music, especially enjoyable being a composition by Tina Rees. One large surprise was when Tina Rees during the playing of an Irish reel stepped out in front of her keyboard and performed in the Irish dance style. The duo has performed around Scotland and they have various individual projects lined up for the future. Look out for their names. I am sure they are both on the threshold of successful careers.